We have two weeks remaining in our 2018 CSA, and while we are still tending and harvesting the crops in the ground, we have also been preparing for next season by sowing cover crops to protect and nourish the soil ahead of our 2019 plantings. 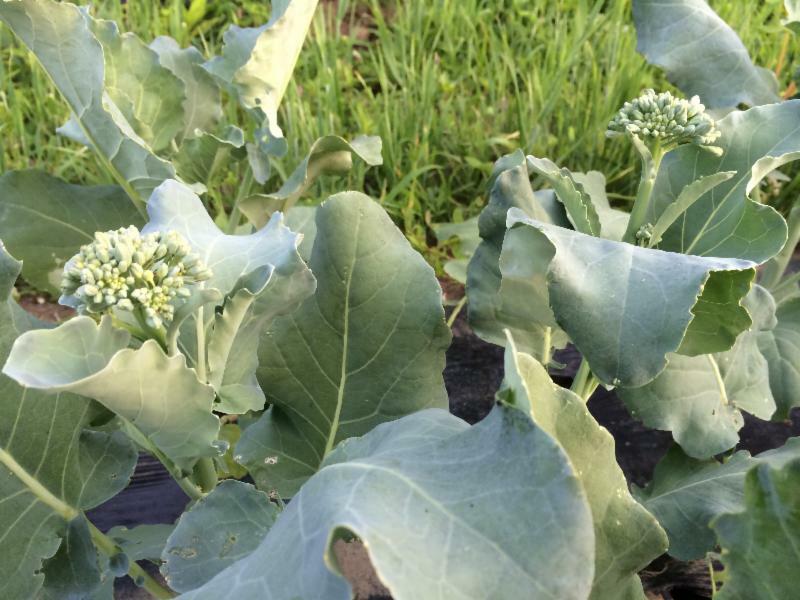 (‘Happy Rich’ Broccoli Florets, below). With that in mind, registration for our 2019 CSA is now open exclusively to you. CSA registration forms will be available at the farm or you can download, fill them out and them to the farm or mail them in. You can also sign up online at our website. Note that there is a discounted rate for paying by check/cash and a special discounted rate if you pay in full by December 1st. And if you pay in full before the end of this year’s CSA, we’ll also send you home with a free jar of our Green Tomato Salsa! We are offer this to thank you for the commitment you have made to your community farm, and because it is extremely helpful to us when you sign up early for the CSA. When you sign up early for our CSA it allows to focus on the farm in the spring, having already completed a heavy load of marketing, paperwork and administrative tasks over the winter months. So as you visit the farm and pick up your produce over the weeks ahead, please consider making a deposit, a full payment or payment of any amount towards next year’s CSA. In previous years we have been able to offer a fall CSA option or November extension, however this year, that is not the case. We have quite a bounty to enjoy over the next couple weeks, but the heavy rains we had over the summer and fall months put a damper on some of our later season crops, including wiping out multiple successions of spinach, arugula and salad mix that we would typically expect to harvest in November. While we won’t have a CSA extension for November, we will continue to harvest everything we can, and will make it available at the New Haven farmers’ markets we attend: Wooster Square on Saturdays, 9am-1pm; Edgewood Park on Sundays, 10am-1pm. We may also set up a stand in the barn during the week so that you can continue to have access to produce here at the farm. Stay tuned for details. A momentary break in the wet last week was just enough to allow us to get our sweet potatoes out of the ground! We’ll send you home with some of those today, and though they should store for quite a while if you like, there is fun recipe below to try with kale and apples that you may want to try right away. We pulled the final green tomatoes off the plants last week. I find that these late season tomatoes don’t hold and ripen as well, so I like use them green, a bit under-ripe, or refrigerate ripe ones until I’m ready to use them. Pickled green tomatoes are a great way to savor the summer over the next few months. Enjoy!